Using a clipped B&W Adjustment Layer to blend elements. In step six of this Photoshop tutorial I needed to blend some jellyfish images set to screen mode. Since the jellyfish images were in full color, I had to decide how to make them gray-scale to achieve my outcome. Here you can see the before and after effects of adding a clipped Black and White adjustment layer. By using a Black and White adjustment layer, rather than just desaturating, I have much more control over the final B&W effect. In this Photoshop tutorial, Andrei Tallent walks you through the creation of this fantasy piece. Both video and written version included. Creative uses of blend modes. Combining images using extractions and adjustment layers. 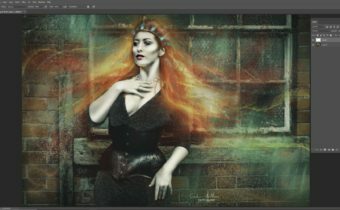 How to use a Gaussian blur on a merged layer to produce a fantastic ambient effect! Wonderful Andrei and so imaginative! Andrei, I think you did a short tutorial on adding strokes and matting to a photo, and I can’t find it. Can you help me? I’ll email you figure this out!